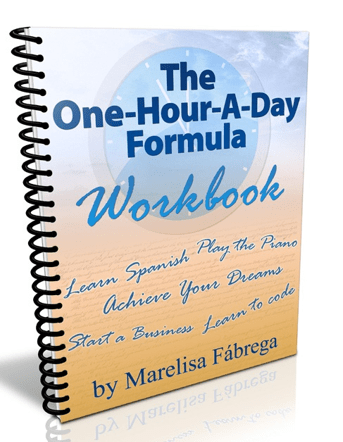 I’m Ma relisa Fabrega, author of “The One-Hour-A-Day Formula”. As a busy lawyer and owner of the popular blog, Daring to Live Fully, I know what it’s like to wish there were more hours in the day to get everything done. I’ve always had lots of interests, and I think of myself as a Renaissance woman (go over my reverse bucket list to read about some of the things I’ve done). If you’re anything like me, you’ve often said the following to yourself: “There’s so much I want to do. So little time to do it.” Well, I got tired of not having enough time to pursue my life goals. That’s why I developed the one-hour-a-day formula. And it changed my life. Create several eBooks which are great sources of passive income. I’m a runner and regularly participate in 10Ks. I taught myself to draw. I meditate daily, as well as practice Qigong and Tai chi. I’m an avid reader — right now I’m tackling Shakespeare. I’m constantly upgrading my skills so I can become a better blogger, reach a wider audience, and increase my blogging income. I’ve taken up French (my fourth language). I constantly give myself challenges, such as a challenge to raise my IQ, trying something new every day for 30 days, a 30-day declutter challenge, and a flat-abs in 30 days challenge. I volunteer at a center that helps victims of domestic violence, offering legal and business advice. As you can see, the one-hour-a-day formula has allowed me to flourish, and it can do so for you, as well. Right now you’re probably asking yourself, “What is the one-hour-a-day formula, and what can it do for me?” I’m glad you asked . . .
An hour a day is enough time to start seeing results in a few weeks. An hour a day is small enough to fit into your schedule. An hour a day is enough time to get into “the zone”. An hour a day let’s you ease into your goals, instead of upheaving your entire life to go after your dreams. Since an hour-a-day is a small amount of time, you can lower your expectations, which means that it will be easier to get started. Setting a time limit to work on a project, such as one-hour-a-day, will make you more creative and more productive. If you devote one-hour-a-day to work on a goal, and then you decide that you don’t want to pursue that goal after all, you’ll have low sunk costs so it will be easier to quit. Then, you can get to work on another, more worthwhile goal. Allotting one-hour-a-day to the achievement of your goals gets you started now, instead of postponing your dreams until “someday” when you have more time. Devoting one-hour-a-day to achieving an important life goal gives you momentum–every day you’ll be doing something to move your goal forward. Knowing that you have one-hour-a-day to work on your goal forces you to break it down into small, manageable tasks, which you can then tackle one by one. One-hour-a-day has a cumulative effect — after all, one-hour-a-day comes to 365 hours a year. As an illustration, in one-hour-a-day you can write one page of your novel; in a year you’ll have a 365-page novel. Discover the difference between your Survival Dance — holding down a job that pays the bills–and your Sacred Dance –doing the work you were born to do–, and how to use your one-hour-a-day to shift from one to the other (this is in the Introduction). Use the same strategy that three men applied to escape the legal profession and write blockbuster thrillers — you’ve probably seen at least one film based on one of their books (Chapter One). How coupling the one-hour-a-day formula with the formula for success allowed one man to go from being an inner-city teacher to becoming a multimillionaire (Chapter Two). How to use the one-hour-a-day formula and the side hustle to find life balance and work satisfaction — it’s how three men got out of debt, found their vocation, and transformed their lives (Chapter Three). Three advanced productivity techniques which allowed one man the luxury of leaving the rat race and start working for himself, in just one-hour-a-day (Chapter Four). 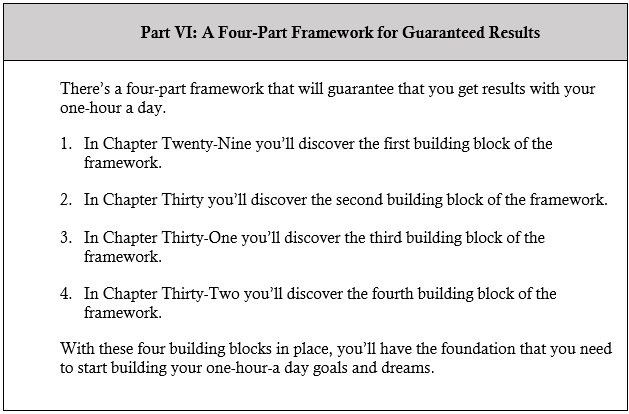 Discover how one man went to work each day to make a living, while at the same time applying the one-hour-a-day formula to make a fortune (Chapter Five). Learn how one woman used the one-hour-a-day formula to go from being a school administrator to becoming one of the most important Latin American writers of our time (Chapter Six). These busy men regularly use the one-hour-a-day formula to learn new skills to improve themselves, grow their business, give themselves a challenge, and have more fun (Chapter Seven). This woman didn’t have four years and thousands of dollars to switch careers; however by using the one-hour-a-day formula she achieved her dream of becoming a designer (Chapter Seven). Learn how to increase your time’s ROI (Return On Investment) and become a wise time investor (Chapter Eight). Uncover how to use the compound effect to radically alter your life — it’s the reason why small actions lead to large results (Chapter Nine). Discover a new way to think of your day which will make all the difference in finding the time to go after what you really want (Chapter Ten). Make a paradigm shift that will allow you to regain control of your time (Chapter Eleven). Use a method taught in Journalism 101 which will allow you to devise a plan for your one-hour-a-day (Chapter Twelve). Uncover how to find the fuel and motivation to get to work on your one-hour-a-day, day after day (Chapter Thirteen). Discover how the Starbursting technique can help you to answer all the questions you may have on how to best use your one-hour-a-day so that you get the results that you’re after (Chapter Fourteen). Use the same method used by a simplicity guru to carve out an hour of your day (Chapter Fifteen). The same tool that you would use to get out of debt and create a “surplus fund” to finance your life goals will cure you of “time poverty”. Discover how to start applying this tool right away to create “surplus time” which you can use to go after what you really want (Chapter Sixteen). What decluttering and organizing a chest of drawers can teach you about making the best use of your time (Chapter Seventeen). The time matrix that will revolutionize how you plan your day .. it’s not the Stephen Covey time matrix (Chapter Eighteen). 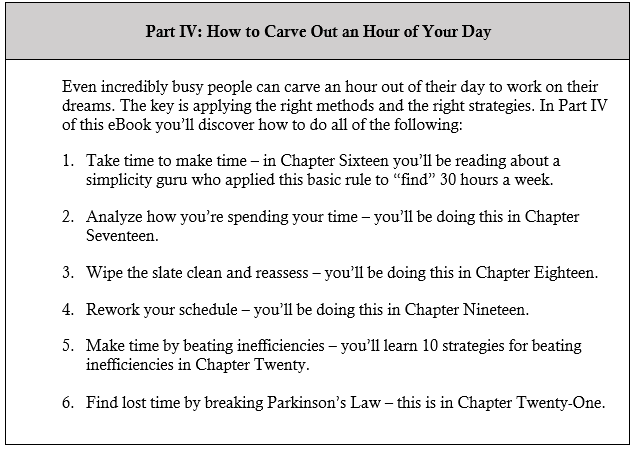 Ten powerful strategies for pinpointing and beating time inefficiencies (Chapter Nineteen). Discover the 12 tiny habit that allowed me to save one-hour-a-day (Chapter Nineteen). The one law you should break to make sure that you achieve your life goals (Chapter Twenty). How one man started applying something he referred to as his “Magic Time” to create an online fitness empire while spending his days training his clients (Chapter Twenty-One). Discover how a mom who was working full-time found the time to start her own business … you can use the exact same approach she did to achieve your life goals, even if you have a family and a job (Chapter Twenty-Two). How one man modified his dream so that he could accomplish it in one-hour-a-day (Chapter Twenty-Three). What Leo Babauta and Steve Pavlina–two of the world’s top bloggers–discovered which had a huge impact on their ability to achieve success . . . it’s the same strategy which was used by Benjamin Franklin and Thomas Jefferson (Chapter Twenty-Four). Use the same method applied by astronauts to readjust your schedule so that you never miss your one-hour-a-day (Chapter Twenty-Four). Learn about the ALERT method, and how it will get your mind and body ready to take full advantage of your one-hour-a-day (Chapter Twenty-Four). A strategy you can use to make sure that your one-hour-a-day doesn’t fall by the wayside . . . it’s the same method used by the financially savvy to set money aside for savings each month (Chapter Twenty-Five). Use the same tactic that Warren Buffett’s right-hand man used to improve himself . . . the tactic worked so well, that today this man is a billionaire (Chapter Twenty-Five). A ten-step process for putting your one-hour-a-day on automatic pilot (Chapter Twenty-Six). What you can learn from the masked swordsman Zorro about achieving your goals . . . you’ll be pulling out your sword ahead of you and ruthlessly carving out an hour for yourself and fighting to protect that hour (Chapter Twenty-Seven). Start applying a process used by the world’s finest chefs to devise a plan for your one-hour-a-day that’s as easy to follow as cooking from a recipe. By the time you’re done reading this chapter you won’t just know what to do, you’ll know exactly how to do it (Chapter Twenty-Eight). Apply the mathematical method in order to “solve the problem” of how to achieve your goals in one-hour-a-day (Chapter Twenty-Nine). The do-it-yourself approach to learning the skills that you need in order to achieve your goals, in just one-hour-a-day (Chapter Thirty). 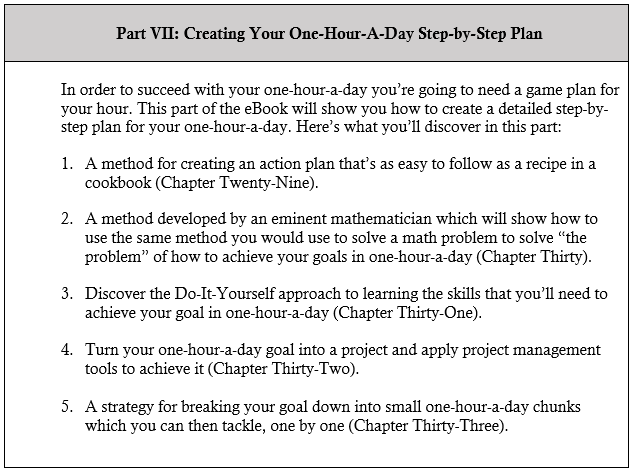 Turn your one-hour-a-day goal into a project and apply project management tools to achieve it (Chapter Thirty-One). 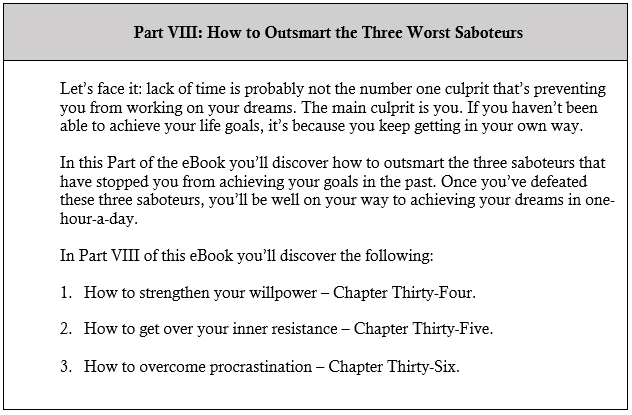 A strategy for breaking your goal down into small one-hour-a-day chunks which you can then tackle, one by one (Chapter Thirty-Two). Four strategies for strengthening your willpower to make sure that you follow through on your one-hour-a-day (Thirty-Three). A 15-step process for getting out of your own way (Chapter Thirty-Four). Step-by-step instructions on how to create your very own anti-procrastination plan (Chapter Thirty-Five). Discover four modern twists to a rule uncovered by an Italian economist born in the mid 19th century; this alone will allow you to do more in an hour-a-day than you ever thought possible (Chapter Thirty-Six). Use the same technique applied by casinos in Las Vegas to generate millions of dollars and by Olympic trainers to produce gold-medalists . . . it’s how you’ll make sure that your one-hour-a-day is working (Chapter Thirty-Seven). Discover how a concept that you learned in kindergarten will keep you engaged and accelerate your progress with your one-hour-a-day (Chapter Thirty-Eight). Use these fourteen strategies to generate all the enthusiasm you’ll need to follow through on your one-hour-a-day until you achieve your goal (Chapter Thirty-Nine). 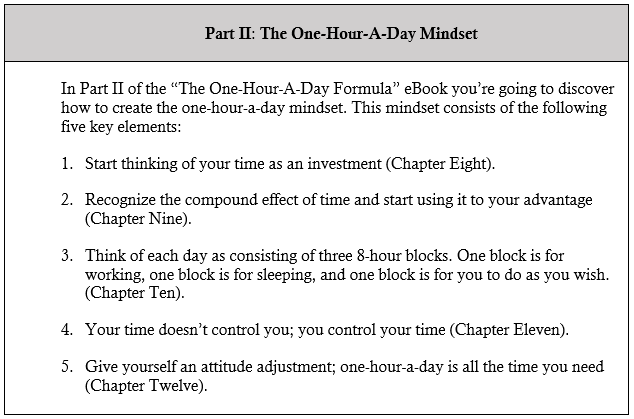 When you purchase “The One-Hour-A-Day Formula” eBook, you’ll also receive “The One-Hour-A-Day Formula Workbook”. It contains 56 Dream Sheets which will propel you into action-mode (it’s a 69-Page PDF). By the time you’re done filling out your Dream Sheets you’ll know exactly what goal to pursue during your one-hour-a-day, and how to carve an hour out of your day to work on your goal. In addition, you’ll have a game plan detailing what you’re going to do with your hour to make sure that you achieve your goal. Get “The One-Hour-A-Day Formula” — plus the workbook– for just $29! Even though “The One-Hour-A-Day Formula” doesn’t cost very much at all, I want you to be doubly confident in your purchase. That’s why I offer a full, no-questions-asked money back guarantee. You can try it out for 30 days, and if you’re not fully convinced it’s worth every cent you paid after that time, simply email me for a full refund: marelisafabrega@gmail.com. P.S. Stop putting your life goals on hold until you can “find the time” to pursue them. 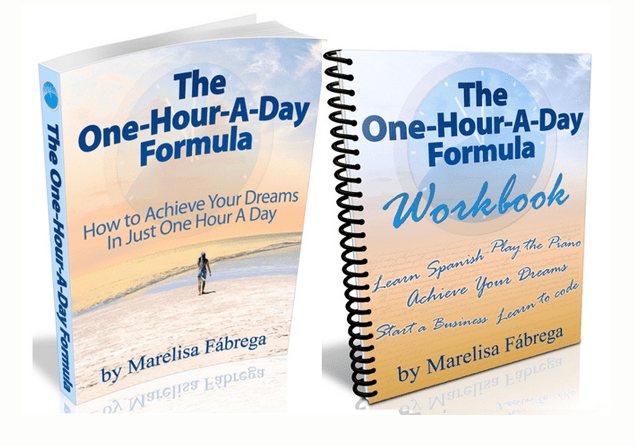 Get your very own copy of“The One-Hour-A-Day Formula” and workbook and start achieving your life goals, now. P.S.S. If you’d like to know more about me, visit my blog Daring to Live Fully, or follow me on Twitter. Also, if you have any questions about “The One-Hour-A-Day Formula”, just ask and I’ll be happy to answer them for you. Send me an email.